The Hive Paonia is Buzzin’! 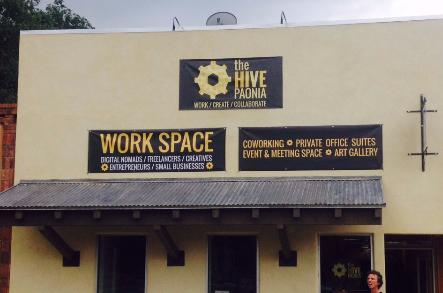 As a front desk host at The Hive in Paonia, I’m often asked the question: “What is this place?” I used to tell people it was a coworking and meeting space. But since opening in May of 2014, The Hive has become much more than a place to conduct business—it’s become a community meeting space, learning center, art library and destination for entrepreneurs across the North Fork Valley. The Hive has new signs! For those unfamiliar with co-working, it’s a concept that allows freelancers, digital nomads and others with workplace flexibility to work side by side in an environment where they share resources, knowledge and a shared ethos. It’s also becoming more popular with larger companies as corporations realize that employee productivity doesn’t depend on being chained to a desk or a windowless cubicle. As a freelance writer, I was tired of spending money in coffee shops just to get out of the house, or being shushed at the library if I needed to take a business call. At The Hive, I have all the resources I need to get my job done efficiently, plus a supportive community to back me up or help me out if I get stuck on a problem. I also get word-of-mouth referrals from other members, which has increased my income and helped establish a good reputation in a new-to-me community. As I started thinking about all the other perks The Hive brings to my work (and personal) life, I thought it’d be easier to see them in list form. So, here goes! Classes—This is my favorite part about The Hive. As a lifelong learner, I love the continuing education offered here. We’ve had classes on everything from Excel to search engine optimization and everything in between. I’ve also taught a couple of classes myself, which is helping develop a new skill that I didn’t even know I had. Workspace—There are a variety of spaces to work in, including the “Colony Room,” “Pollen” and “Nectar” meeting rooms, two small focus rooms, and a soon-to-be-completed “Low Buzz” room for worker bees who need quiet. 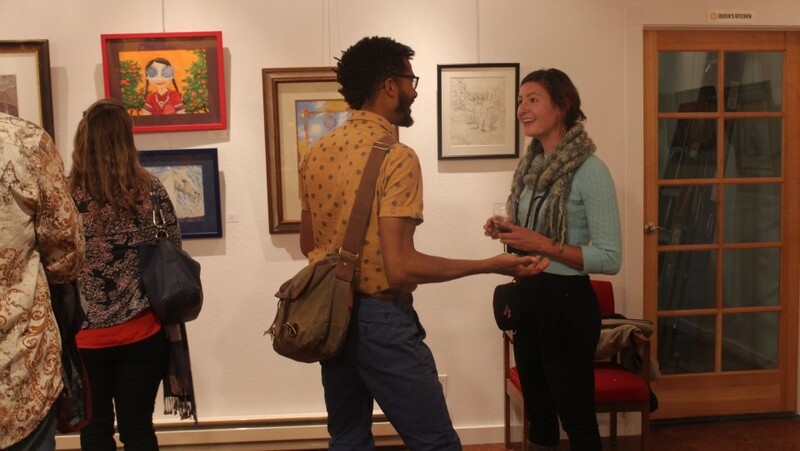 Networking—The Hive is filled with entrepreneurs, creative and generally connected and motivated people. Colliders—Another event I love is the bimonthly colliders. One happens in the morning (coffee collider) and the other is in the evening (cocktail collider-BYOB). We enjoy beverages and each others’ company while one member takes the hot seat to get feedback on their business or help with a specific challenge. Community Supported Art Library—Did you know that you can check out art like you check out a book? Only in Paonia! Come visit the CSA library, located inside the Hive, as the selection of pieces and participating artists is growing daily. Friendly hosts—From nine to five Monday through Friday, a smiling host greets all visitors at the front desk. It’s a nice touch and makes me look super professional if I have to meet a client in the space! Lending library—The Hive has TWO lending libraries, one for business topics and one for self-improvement and personal growth. 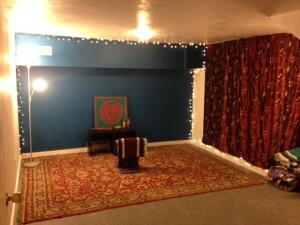 Meditation Room—Another amazing feature that is not only available to our members, but to the whole community, is our beautiful mediation room. Anyone is welcome to use the space and a meditation group meets here on Tuesday evenings. It’s so nice to have this healing mini-retreat on site. Kitchen/lounge—Stay healthy by bringing your own snacks and lunches. You can keep them in our fridge. We also have batgammon and a pool table! Work sprints—On Wednesdays at noon, we hold “work sprints,” where members focus on one specific task, such as cleaning up email inboxes or following each others’ businesses on social media, for one hour. And, last but certainly not least—FAST internet (Hallelujah!). We’ve invested in a fancy booster that lets you get online quick. The Hive shares space with the Paonia Chamber of Commerce and also hosts community meetings organized by Delta County Economic Development and Region 10. Next time you’re on Grand Avenue, stop in for a tour. One of our smiling hosts will be glad to show you around. It might even be me : ).